Mrs. Konty's GATE students supported local businesses by designing several Black Friday scavenger hunt turkeys. ​A post-Thanksgiving holiday shout out goes to Pueblo Community College and Cañon City High School vocational automotive instructor John Duston for striking up a partnership with the Subaru Auto Company. This has netted our program more than $100,000 in product donations, including five contemporary vehicles and a Universal Diagnostic Tool. John reports all 20 of his advanced students have already achieved Level One Subaru Certification. This means they can approach any Subaru dealer for a job. Mr. Duston says his program has even begun offering level 2 certification opportunities, and is now only two courses away from being able to get students there. What great vocational opportunities are available to our students. There was a story in a recent issue of our local newspaper describing a drug sting that took place at Rudd Park. For the past two years Cañon City Schools has been working closely with the Cañon City Police Department to address issues at the park. Last year our city council helped by passing an ordinance forbidding smoking within 100 feet of playground and picnic equipment. This, coupled with the arrival of a new police chief and a change in SRO staffing has pretty much eliminated participation by CCHS students in the activities that have been taking place at Rudd for years. Drive by before school, during lunch, and after school and you’ll notice the daily gathering has dwindled a bit, with reports from our SROs indicating crowds made up mostly of dropouts and students from local online academies. Thanks to this law enforcement support at Rudd we are actually receiving reports from families who live nearby that for the first time in years they are able to take young children to enjoy it during a school day. There is still a lot of work to be done on this front, with the hope our growth and development curriculum will decrease the likelihood children will seek out the type of behavior that has been happening at the park. However, with police and city support, we are finally beginning to make headway. Finally, I also want to thank Mrs. Konty and our Harrison Gifted and Talented Education students for the beautiful work they did designing Thanksgiving turkeys to be used for a local business scavenger hunt. The final products were amazing and I noticed lots of folks enjoying the Black Friday activity they were made for. The Board of Education watches a student presentation after swearing in members and reorganizing. 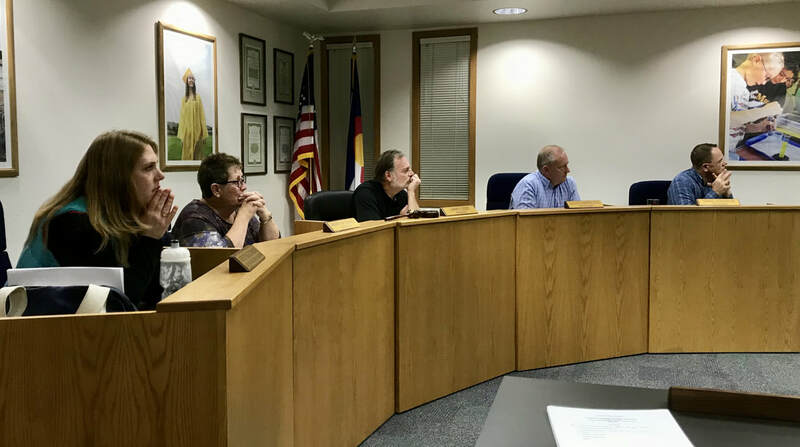 At its November 13th meeting the Cañon City School District Board of Education conducted its biennial reorganization. After swearing Mary-Kay Evans and Shad Johnson in for their second terms, it was moved the officer structure of the board stay the same through November 2019. Thus, Larry Oddo will remain board president, Lloyd Harwood vice-president, Mar-Kay Evans secretary, Shad Johnson treasurer, and Kristyn Econome secretary/treasurer. With the need to execute $7.5 million in building improvements over the next nine months, and to work to secure BEST grants for two new buildings, the board has allowed us to conduct a search for owner’s representative services. An owner’s representative supports a school district in its relationship with its architect and builder on major construction projects. If our board approves a request for proposals we have prepared, we’ll begin advertising our search as early as Tuesday November 28th. We hope to accept applications, interview agents, and establish a work relationship before Christmas. CCSD Director of Finance Buddy Lambrecht has been working with our partners at RBC Capital to prepare for our first post-election bond sale of approximately $3.8 million. This will secure matching funds for our multi-facility improvement grant as well as for the Mountain View Core Knowledge School facility loan payoff. Just before the Thanksgiving break I had attended a CCHS Technology Committee meeting where key decisions were made to prepare staff and students for the implementation of a one-to-one device program next fall. Principal Bill Summers guided the meeting and good work was done toward making a decision on a device, preparing teachers to support student use of them, and visiting some model schools that have recently begun such programs. Cañon Exploratory student Erin Sallie shares her knowledge of mountain biking with the board of education. During the week before Thanksgiving I continued work on federal programs grant mid-year revisions, attended a board work session and meeting, attended a CCPD touching base meeting, conducted a Superintendent’s Advisory Council meeting, attended a Pueblo Community College advisory committee meeting, held a District Leadership Team meeting, touched base with Adam Hartman about instruction matters, and then with Lynnette Steinhoff about special education matters, attended a quarterly CCEOE meeting, attended a high school technology committee meeting, and traveled to Springs to participate in a regional superintendents meeting. I spent Thanksgiving week with my family. Thanks to taking the entire week of Thanksgiving off I’ll have a few hundred emails to catch up on when I return to work on Monday. When done with that, I’ll work to finalize federal programs grant revisions, and then attend a board work session. I’ll be out of the office on Tuesday morning for personal reasons, but will conduct an instructional leader PLC session in the afternoon and attend a Cañon 2020 meeting in the evening. On Wednesday morning, I’ll attend a Southern Superintendents meeting in Pueblo and then meet with Parks and Recreation Director Jim Hoar about our Kids Klub partnership. I’ll be working around the office on Thursday before attending a CCHS Technology Deployment meeting. On Friday and Saturday, I’ll be in Colorado Springs with the board of education attending the annual Colorado Association of School Boards convention.